Do they know each other? I know they would hit it off. They're both New Yorkers who started their careers in the 70s. I saw them perform a couple days apart mid-April and they're both phenomenal. 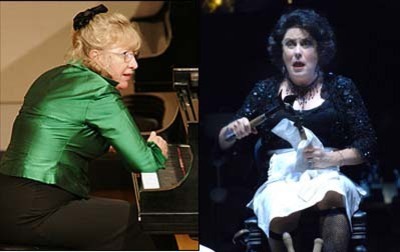 They both perform with authority so complete that they don't work up a sweat--even though Oppens played Carter's "Night Fantasies" as if the Steinway was an object to be destroyed, and Kaye's Mrs. Lovett charmed Sweeney Todd, danced, cut up, got laughs, helped with props, and even played the triangle and tuba. What a pleasure to watch people having fun. Would somebody please commission a "Duet for Avant-Garde Piano Virtuoso and Musical Comedy Diva"?